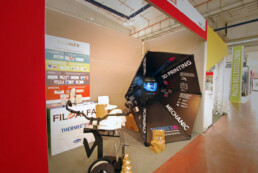 The Studio has been called to design the FILOALFA® stand for Mecspe 2018. 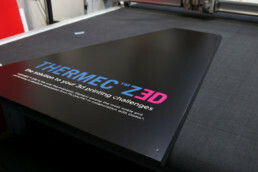 During the occasion they launched their new filament THERMEC™ ZED, developed in collaboration with Domo. 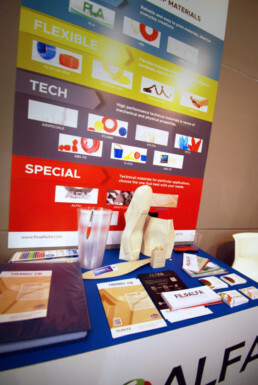 The idea was to communicate the innovative characteristics of the 3d printing filament shown in a video and by the Italian Volt motorcycle fairing 3d printed by Wasp Project. 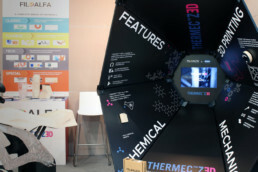 An irregular shape has been designed to guide the observer’s eye to the monitor where the video was playing, in the meantime enhancing THERMEC™ ZED’s features.